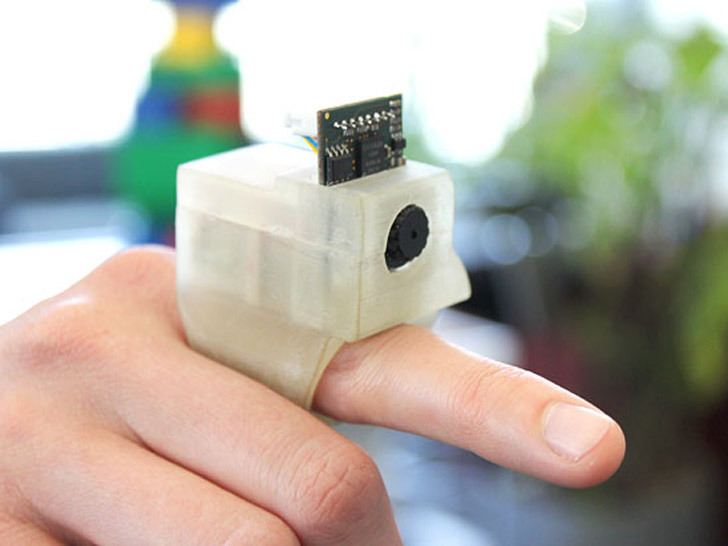 “Point and click” could soon take on a whole new meaning with the “EyeRing,” a novel finger-worn interface designed to help the visually impaired better navigate their environment. A work in progress by Roy Shilkrot and Suranga Nanayakkara at MIT Media Lab, the Bluetooth-connected device serves as a “virtual cane,” one that not only detects obstacles in its wearer’s path but also reads signs, identifies currency, and perceives color. The EyeRing can be adapted for other non-seeing applications, as well, such as helping children learn to read or assisting tourists in a new city. The 3D-printed EyeRing features a built-in camera and microprocessor that relays information to a smartphone. "Point and click" could soon take on a whole new meaning with the "EyeRing," a novel finger-worn interface designed to help the visually impaired better navigate their environment. A work in progress by Roy Shilkrot and Suranga Nanayakkara at MIT Media Lab, the Bluetooth-connected device serves as a "virtual cane," one that not only detects obstacles in its wearer's path but also reads signs, identifies currency, and perceives color. The EyeRing can be adapted for other non-seeing applications, as well, such as helping children learn to read or assisting tourists in a new city.